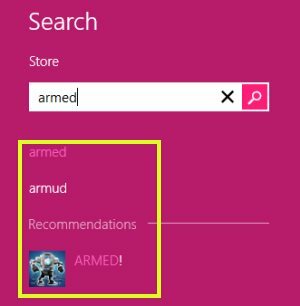 Here is a Windows 8 tutorial on how to search an app in Windows 8 store. Microsoft has been ripping off the roof and sprinkling hundreds of amazing apps in the newly built Windows 8 store. Now, when we have a good collection of apps, its high time that we learn how to search an app in Windows 8 store. Yupp…after doing a long R&D, I finally know how you can quickly find an app. Earlier we posted a tutorial on how to install an app from Windows 8 store. 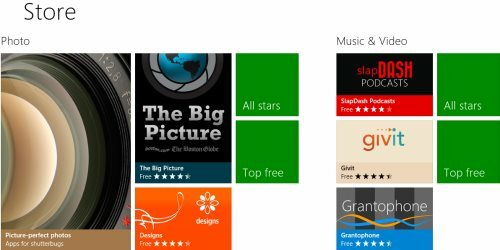 However, many of our readers raised a question as to how to search apps in Windows 8 store. Hence, in response to the question raised by our readers, this time we are upto a Windows 8 tutorial on how to search an in Windows 8 store. Go onto the Windows 8 store where you will find hundreds of apps. Press Windows+Q in combination to let the search panel appear on the screen. Click on “Store” to filter the results. Now, type the name of the app that you want to search in the “Search Bar” at the top right side. Fortunately, if the keyword matches with any of the Windows 8 app, it will quickly display you as results. Yupp…you are done. You will be soon find you favorite app in just a next second. The good part is that you can also filter the results by category such as Games, Social, Music & Video, Books & Reference, Health & fitness; or by “Prices” as Free, Free & Trial, Paid; or even by “Relevance” as sort by newest, sort by highest rating, sort by lowest rating, and the like. However, if you somehow do not like Windows 8 store, then you can disable the Windows 8 store completely. You can read our tutorial on how to disable the Windows 8 store. Well, do not worry, you van also enable it anytime.